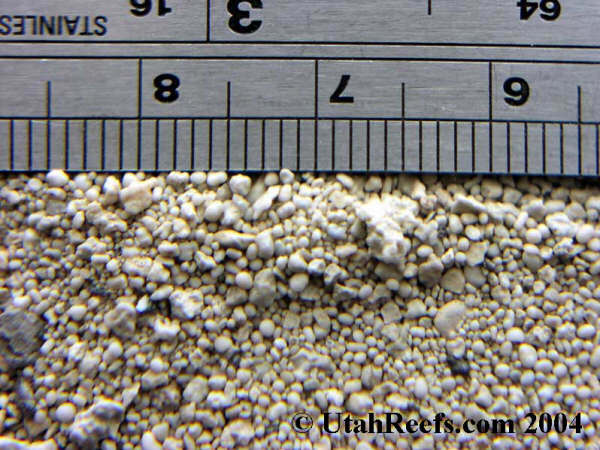 Oolitic sand is a common category of sand used by aquarists. The oolitic term describes the formation and type of sand. This sand is generally very small, fine, and round sand. Numerous hobbyists have used this sand in their tanks for many years, while others are still unaware of its existence. Some hobbyists argue against the use of this sand for various reasons, including; possible pollutants and contaminants, origination may not be of a marine source, potential problems for pH and alkalinity stabilization. 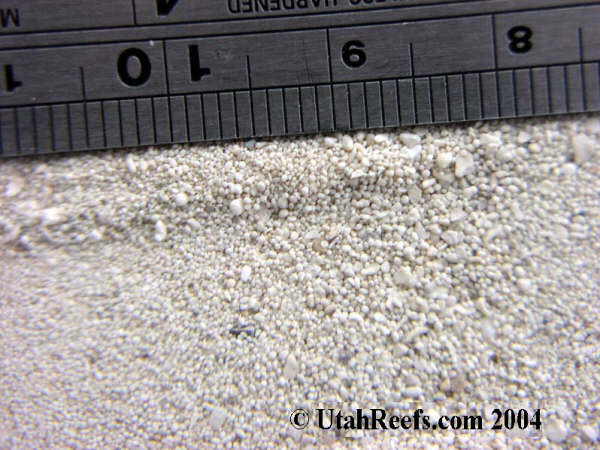 Advocates of these sands claim they have: buffering capabilities, increased surface area for filtration purposes, low costs, and are composed of the same elements as high grade reef substrates. The purpose of this experiment was to test three common oolitic sand types for major element levels. These sand types were Great Salt Lake sand, the CaribSea Oolitic sand product, and the Southdown play sand found in Home Depots back east. The Southdown sand sampled was actually an OldCastle brand. Our supplier of this sand claims it is the brand and supplier to the Southdown play sand distributors. Since how sand looks is important to most people, a picture of each of the sands is included. The scale in all pictures is in millimeters. All three sands together to show the color differences. CaribSea on left, OldCastle in middle, GSL on right. One last picture. 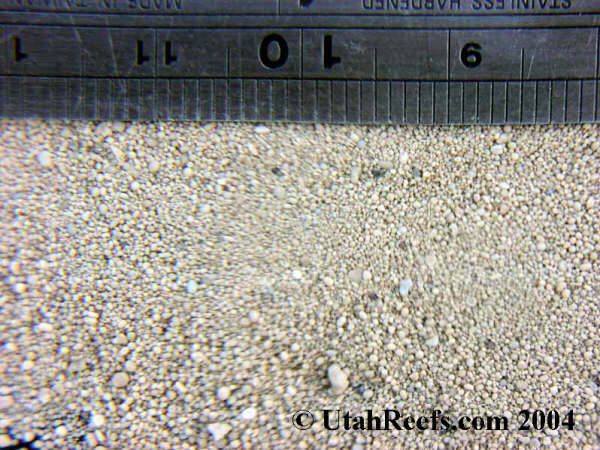 This is a picture of Great Salt Lake sand which was washed and screened. The result is sand closer is size to the OldCastle. 20 grams of each sand were dissolved in 100 ml of 4 N HCl then diluted to 500 ml. The samples were filtered and the filtered material weighed to determine how much silica sand was present. Although this un-dissolved material was not analyzed, it was assumed to be silica. It could also contain aluminum and other “clay” type constituents. For the purposes of this test anything that did not dissolve in HCl was considered “silica”. The dissolved sand sample was then titrated to determine calcium and magnesium content. The magnesium number is really the total hardness due to compounds other the calcium. Since strontium, iron, etc are most likely very low, the whole amount was assumed to be magnesium. The pH of the dissolved sand sample was then increased to 4.0 by addition of 1 N NaOH. This adjusted sample was then tested for iron, copper and phosphorous using a HACH 2000 Spectrophotometer. The results of this test are summarized in the following table. The CaribSea and OldCastle oolitics tested identical in all aspects. 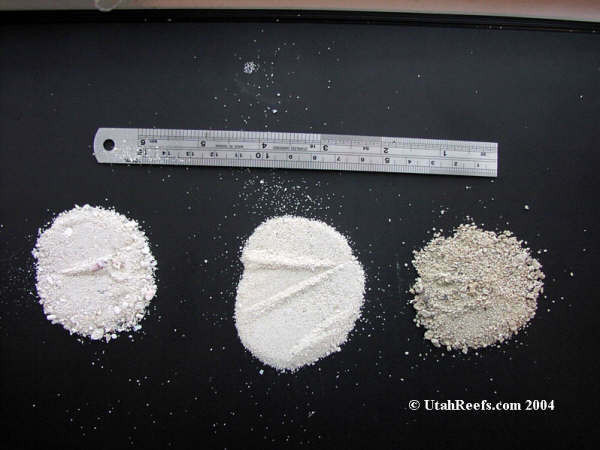 The GSL oolitic tested 4.5 times higher in phosphorous, 4 times higher in iron, 2 times higher in magnesium, 6 times higher in silica, the same in copper and slightly lower calcium when compared to the other two sands. Whether this is significant or not is open to your debate. There are many other elements that could be present that were not examined, we leave that exercise to someone else. This study has shown similarities and differences in common oolitic sand samples. Due to the varying and wide range of beliefs regarding sand solubility and the effects of those solutes, the authors do not wish to make recommendations in favor of nor against the use of these products. Adam Blundell M.S. works in Marine Ecology, and in Pathology for the University of Utah. While not in the lab he is the president of one of the Nation’s largest hobbyist clubs, the Wasatch Marine Aquarium Society (www.utahreefs.com). He is also Director of The Aquatic & Terrestrial Research Team, a group which utilizes research projects to bring together hobbyists and scientists. His vision is to see this type of collaboration lead to further advancements in aquarium husbandry. Adam has earned a BS in Marine Biology and an MS in the Natural Resource and Health fields. Jon Finch lives a double life. By day he is a chemical engineer at a local oil refinery. By night he is a husband and father of three. Througout his life he has always been fascinated by aquariums. Like many, his beginnings were with typical freshwater fish, but he quickly moved to cichlids and eventually to heavier water :). His first reef tank was in the early 1990s. Jon’s current tank is a 125 gallon mixed reef. Jon really enjoy the DIY aspects of this hobby and the science behind the scenes. Because of Jon’s knowledge and love for the way things work, he is simply known as “The Aquarium Chemist”. 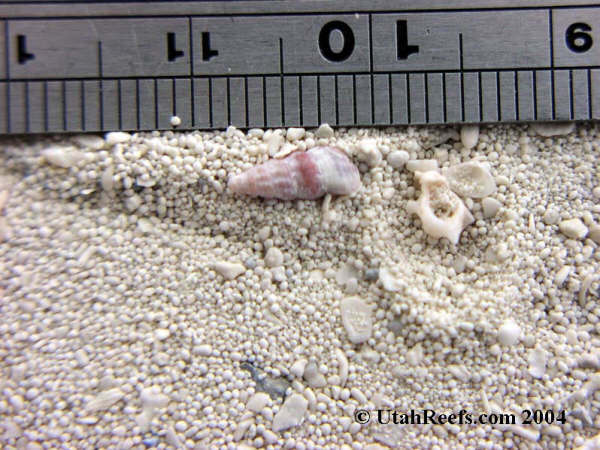 For more information, or for further discussion, the authors welcome you to join them by visiting www.UtahReefs.com.